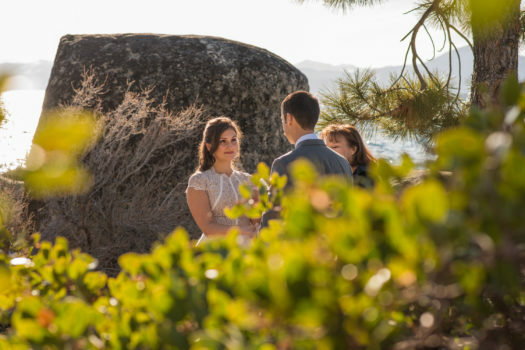 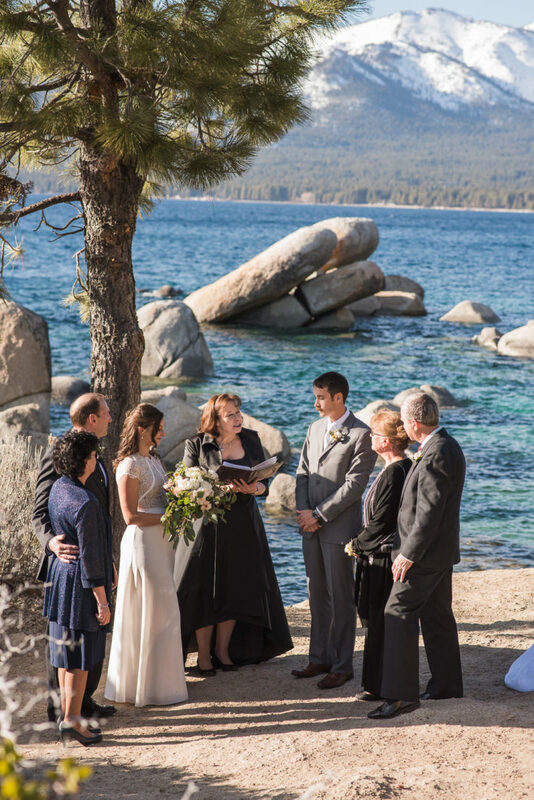 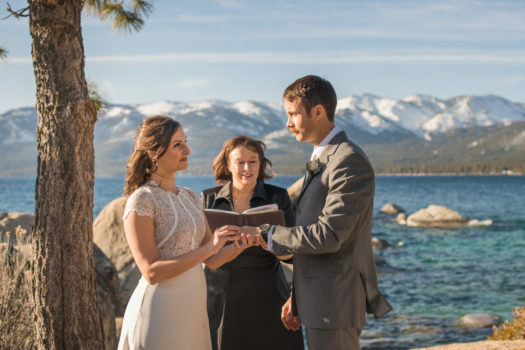 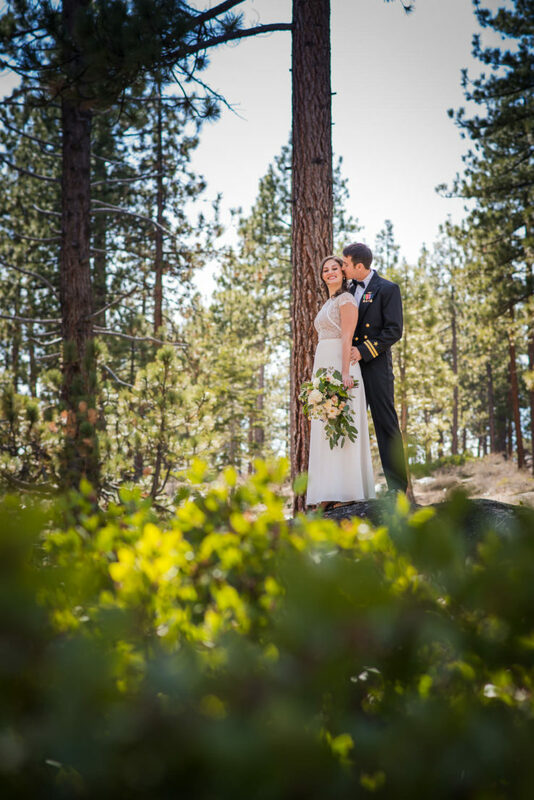 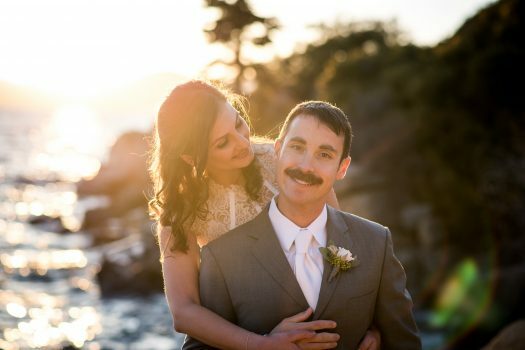 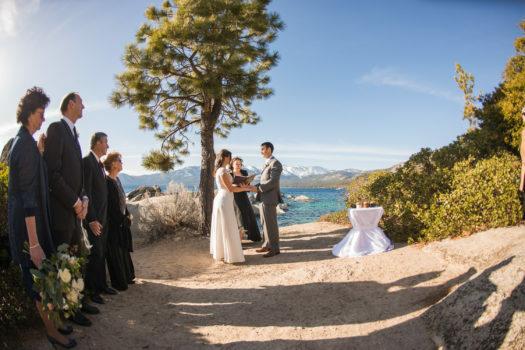 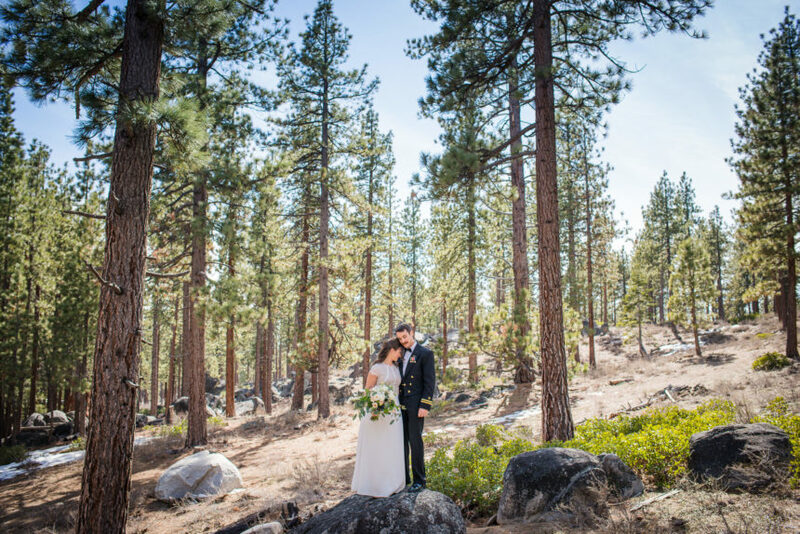 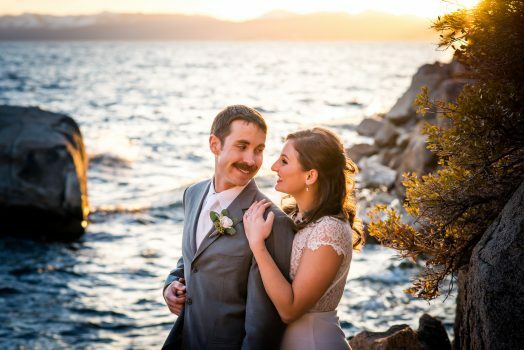 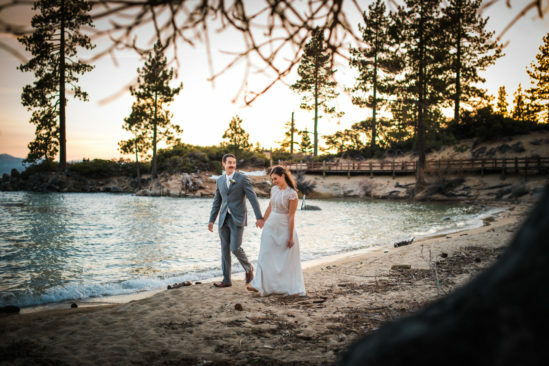 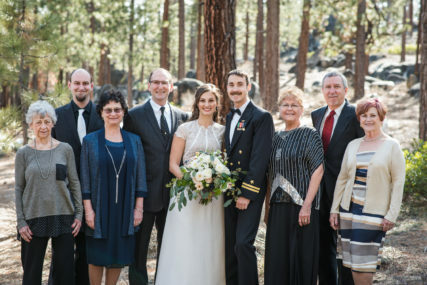 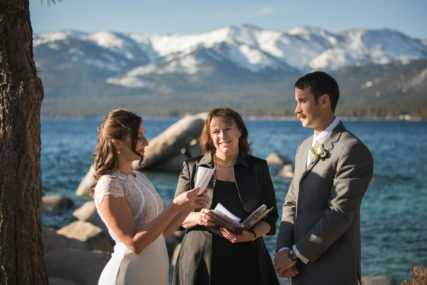 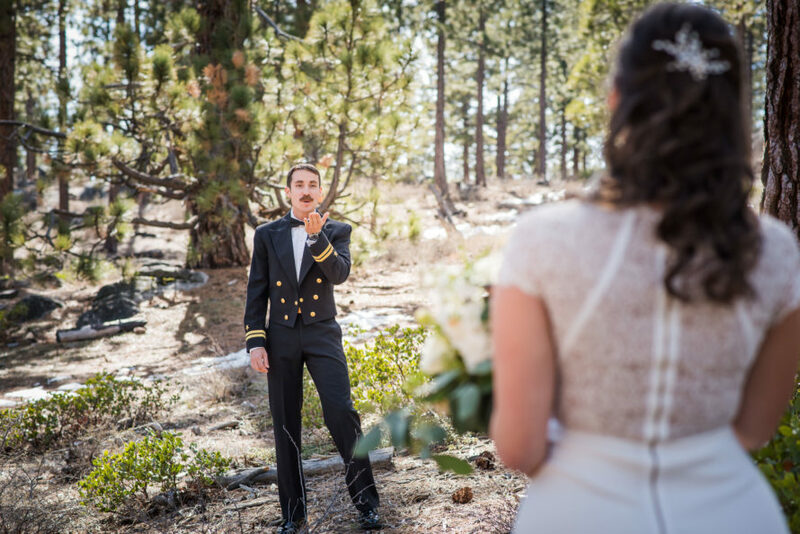 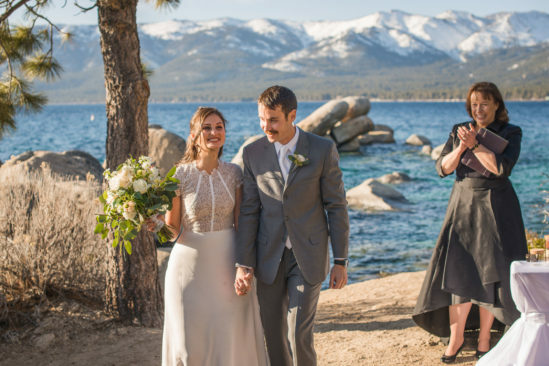 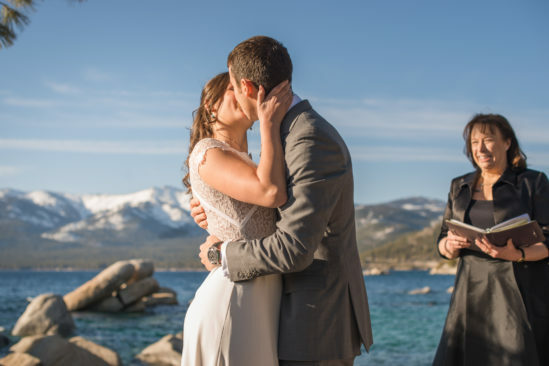 Katie and Charles decided to have a Lake Tahoe Sand Harbor Elopement with just their close family present to help them celebrate. 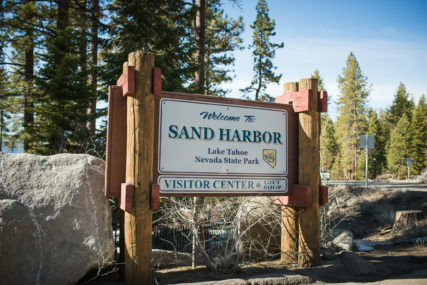 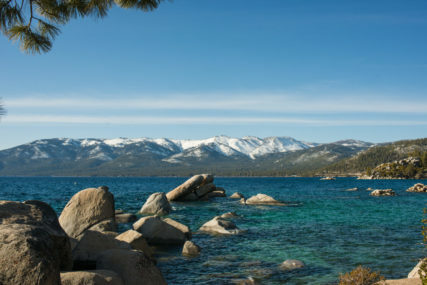 Sand Harbor is one of those places that when you envision Lake Tahoe it comes to mind. 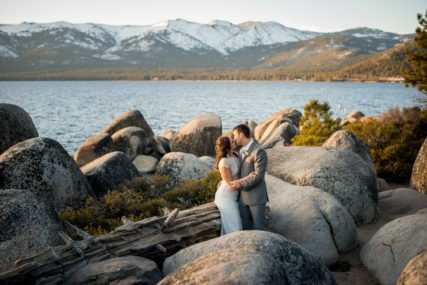 The crystal clear waters with surrounding boulders jutting out of them always make for such a stunning and dramatic backdrop. 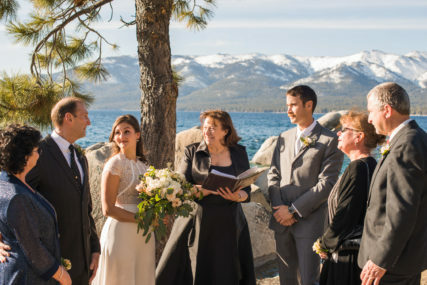 Being March in Tahoe we were beyond relieved that a huge snow storm did not ensue on their special day and we were so excited that the sunshine came out and blue skies were ever present. 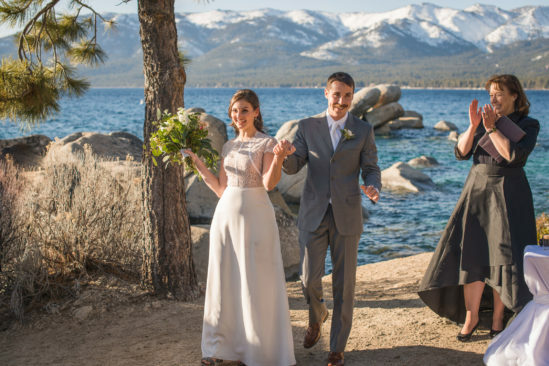 Needless to say that we were over the moon for how these two looked together and Katie’s Nha Khan dress was beyond perfection. 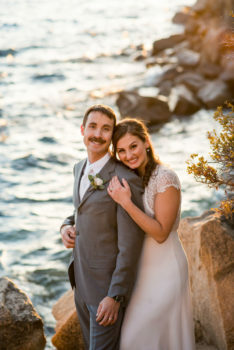 Katie & Charles are one of those couples that look like they came straight off the pages of a royalty magazine. 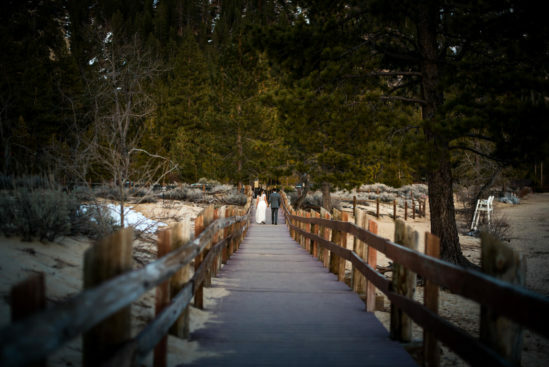 In all seriousness though, just look at them! 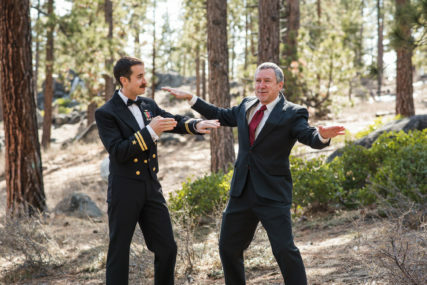 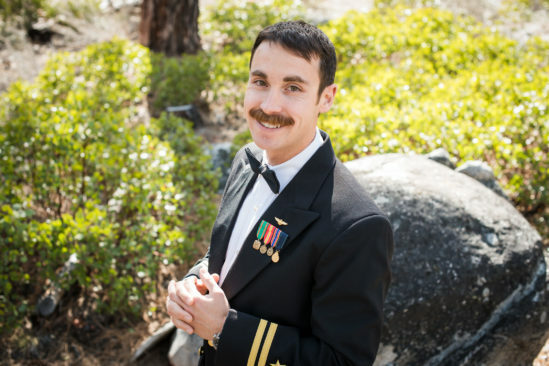 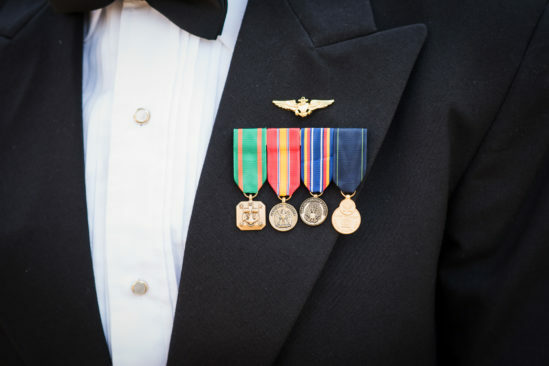 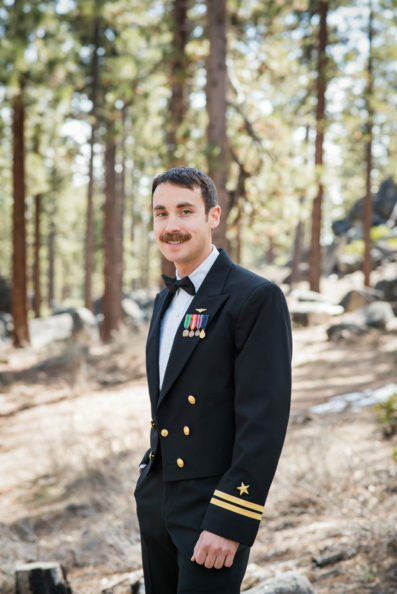 !As Charles is in the Air Force we captured some images of him before the ceremony in his full military dress before he changed into his suit and he looked so very handsome!! 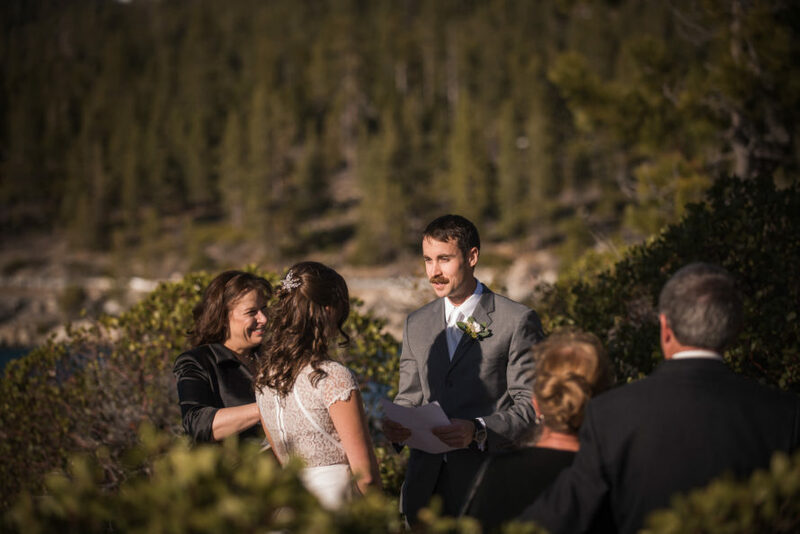 It goes without saying that we were pretty happy that he did. 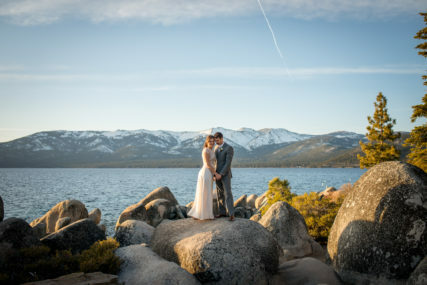 All day long they were just both so effortlessly photogenic and we had such a great time together exploring Sand Harbor into the sunset. 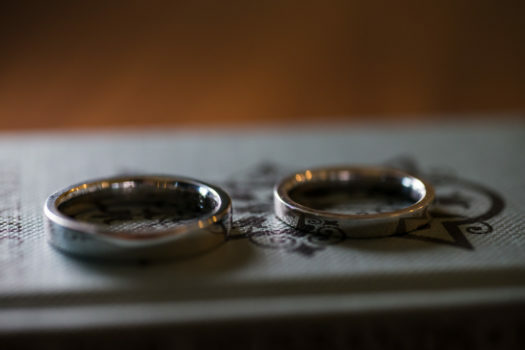 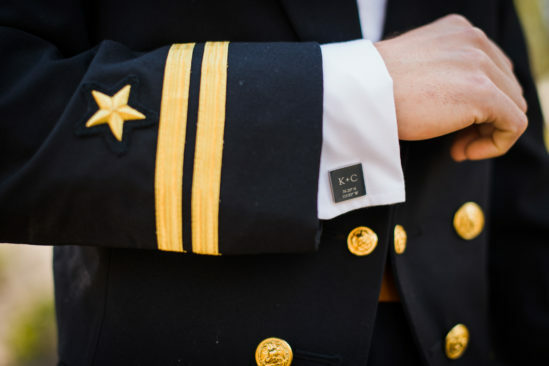 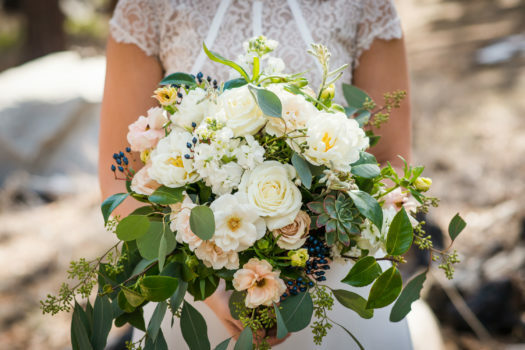 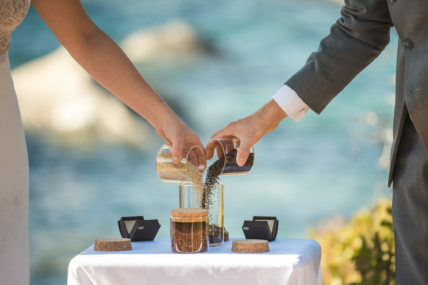 Worth mentioning is one of the many things we really love about weddings and always keeps it fresh is getting to see how couples can personalize their wedding day and details. 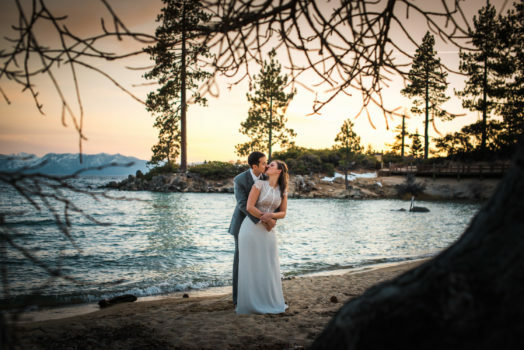 These two opted to have a quinoa ceremony instead of a sand ceremony during their heartfelt vows as they are both always cooking up something healthy together in the kitchen. 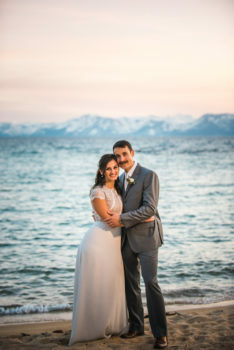 Also needless to say we were thrilled that you hired us both as a husband and wife wedding team to document your love story. 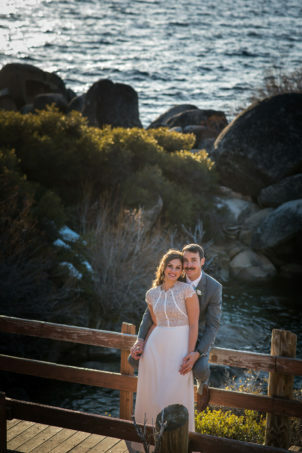 Even though your event was intimate it was awesome that you wanted us both there. 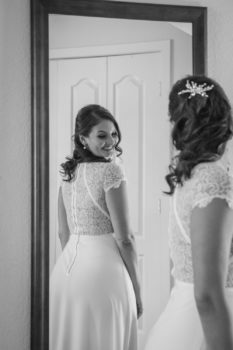 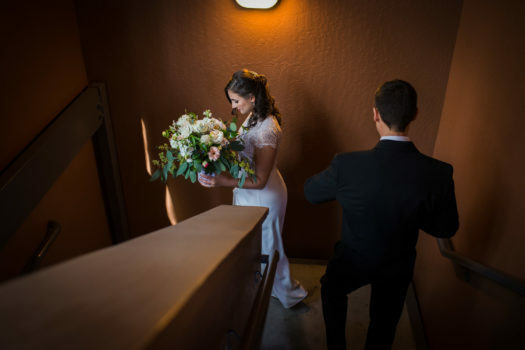 We really feel that it really complements the wedding day no matter how small an event to have two photographers as it really helps to tell the story from two different perspectives and angles. 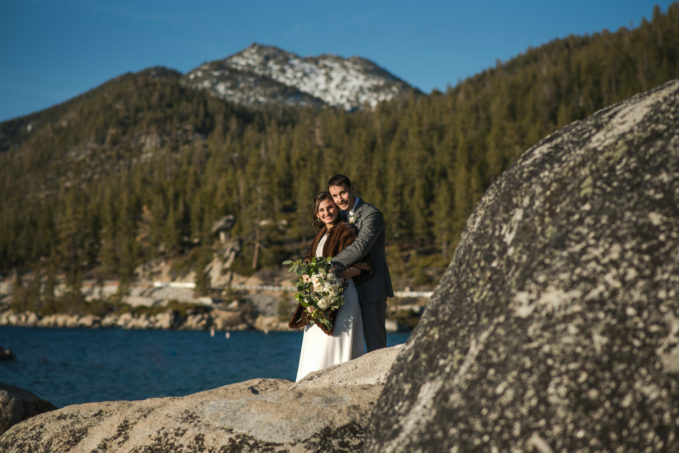 Congratulations again to you both….you are wonderful together and we wish you the very best in love and life!! 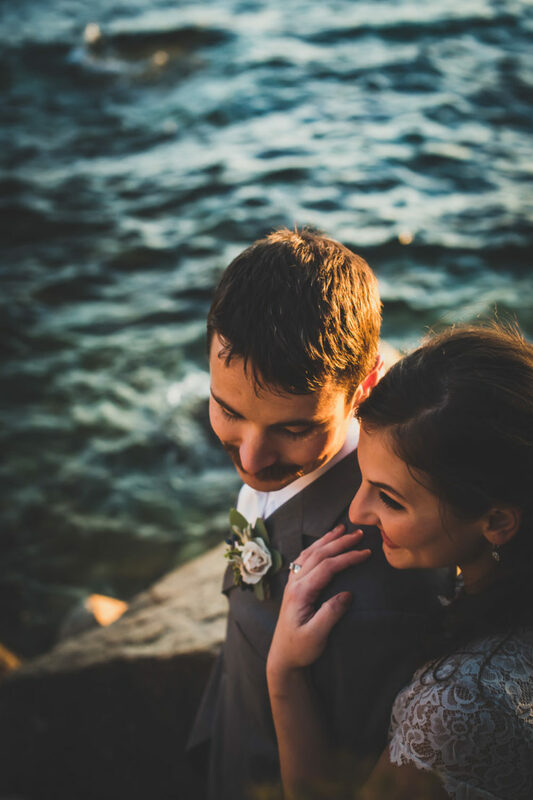 Having had a pretty small wedding ourselves(17 people there total) we definitely have a soft spot for more intimate celebrations. 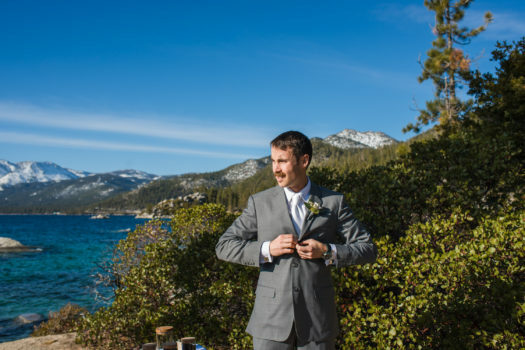 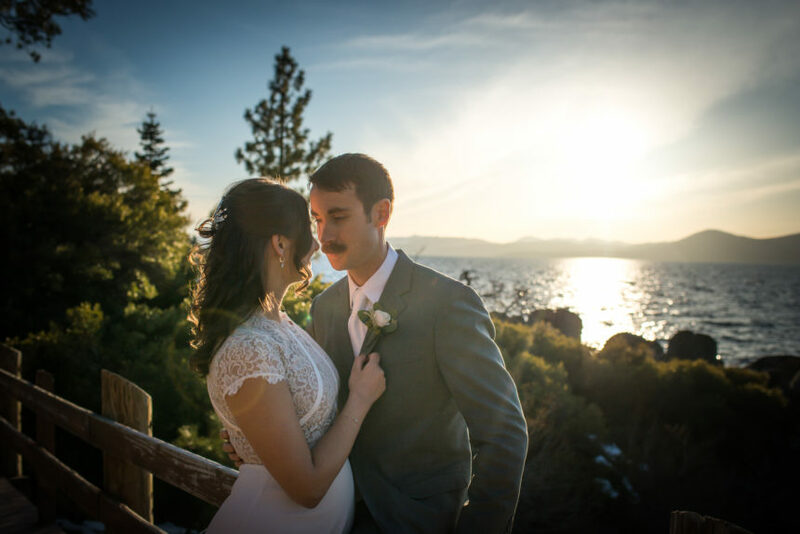 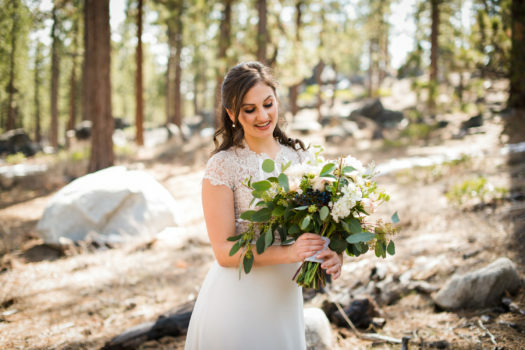 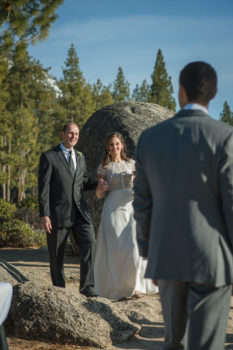 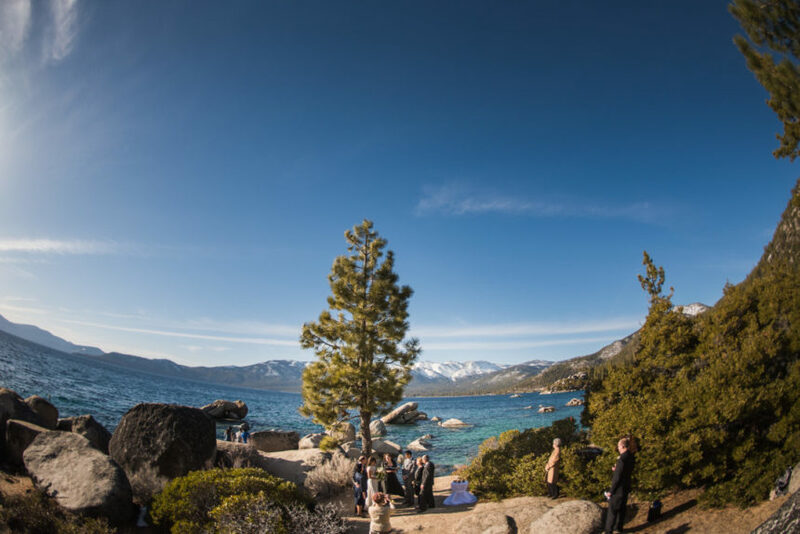 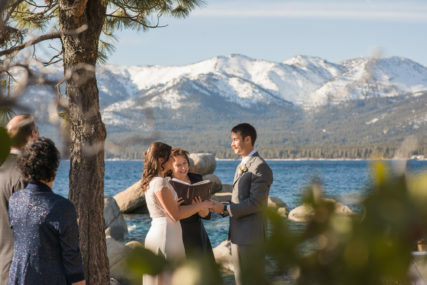 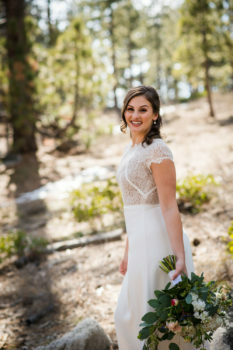 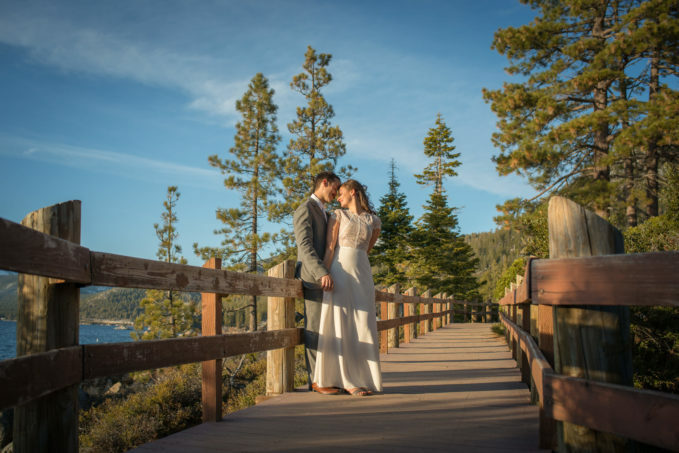 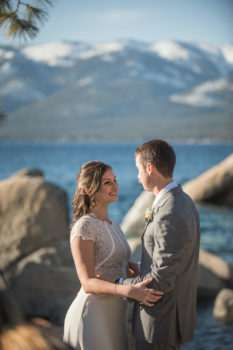 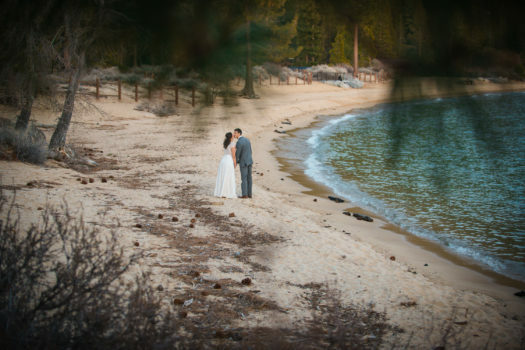 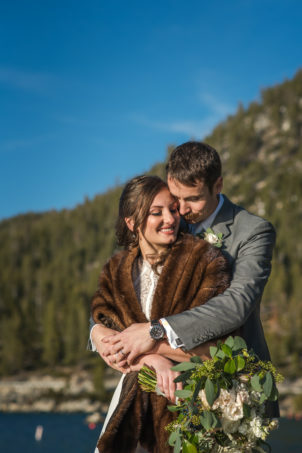 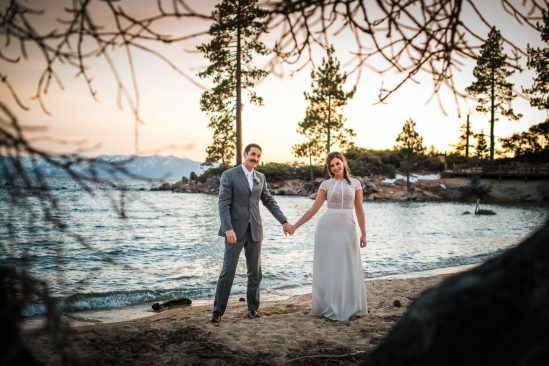 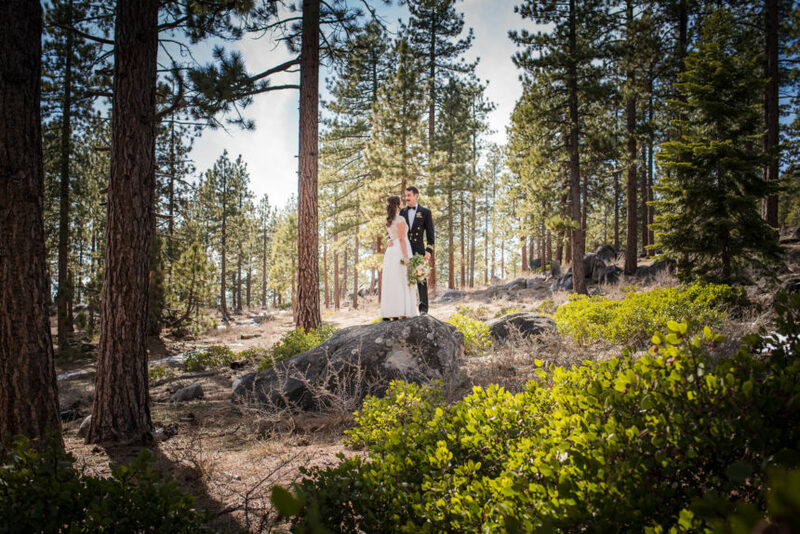 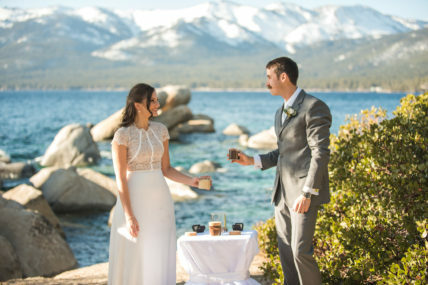 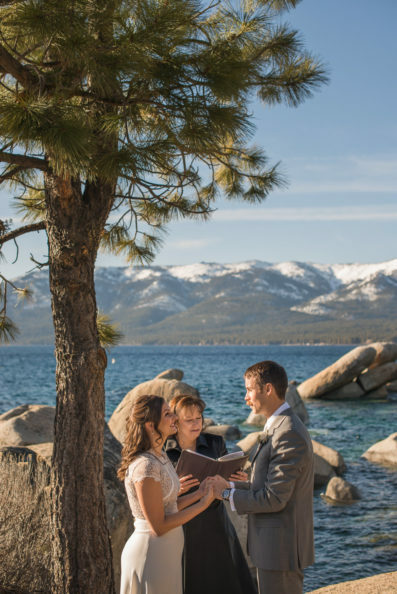 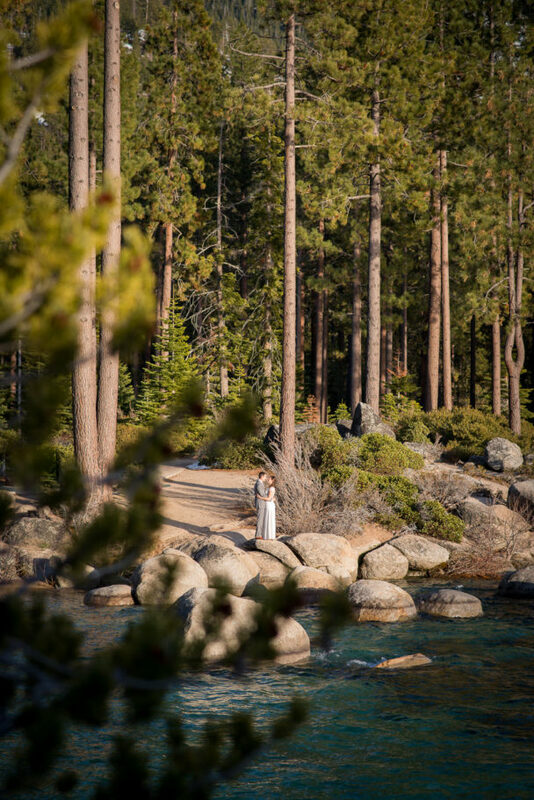 If you are looking to book a Lake Tahoe Sand Harbor Elopement Photographer or Elopement Photographer for that matter, we’d LOVE to chat with you.